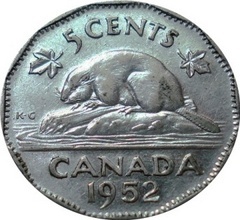 1937 was not just a year for the appearance of a new monarch on Canadian coinage, it was also the year that introduced collectors to the modern “Beaver on Rock” design still in use today. The obverse, designed & engraved by T.H. Paget, features the bust of George the VI facing left. At the bottom of George's neck are the designer’s initials “HP”. On the outer periphery are the words "GEORGIVS VI D:G : REX ET IND : IMP :". The reverse, designed & engraved by W G. E. Kruger-Gray, features a beaver on a rock. To the right of the beaver on rock design are the designer’s initials “KG”. On the upper outer periphery is the denomination “5 CENTS” with a maple leaf flanking each side. On the lower outer periphery is the word “CANADA” and year. Though George VI 5 Cent coinage ran for only 15 years ( a short run for a series), it did manage to produce quite a few type and varieties with World War II as one of the major contributors for the types. Tombac - Early in World War II, the demand for nickel soared in efforts to support the war. The demand became large enough that the Canadian mint had to cease issuing 5 cent coinage using nickel and replaced it with a material known as tombac (a brass type of alloy). Shape Changing - With the use of tombac coinage looked similar in color to that of existing copper cents. In an early attempt to differentiate the two, mint officials changed the shape of the 5 cent coin from round to 12-sided. Accepting Steel - Regardless of the mints attempts, public acceptance of tombac coins never took hold. In a last effort to garner public acceptance, the mint changed compsition one last time to chrome plated steel. The similarity in color to nickel coinnage finally hit a spot with the public and provided a soultion until the end of World War II only to be used again when nickel was once again in demand due to the Korean War. In 1947 India received its independence. 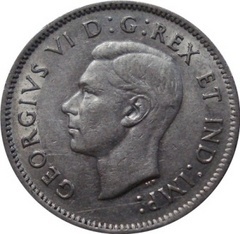 The obverse legend "IND IMP" (India's Emperor) had to be removed from the King's titles on any British Commonwealth coins dating 1948 or newer.